A small format panoramic gelatin silver print of a group of men, women and children standing outside. Many of the men are wearing Shrine fezzes. Taken at Boulder, MT, at a joint Shrine picnic of the Algeria and Bagdad Temples. Verso has the number 56 faintly stamped on it, LR. TAFC.2009.104 ~ Ball game between Algeria & Bagdad Shrine at Boulder, Mont. A small format panoramic gelatin silver print, view from the outfield toward home base, a group of men in Shrine fezzes playing baseball. Behind home base are visible a small log cabin and a large haystack, as well as a period car, left. Mountains in the distance. A crowd of people look on, right. Taken at Boulder, MT, at a joint Shrine picnic of the Algeria and Bagdad Temples. A duplicate print of TAFC.2009.105, except is lacks the in-frame writing, instead with “Ball game between Algeria & Bagdad Shrine at Boulder, Mont.” typed in lower margin. Verso has the number 11 stamped on it, LR. 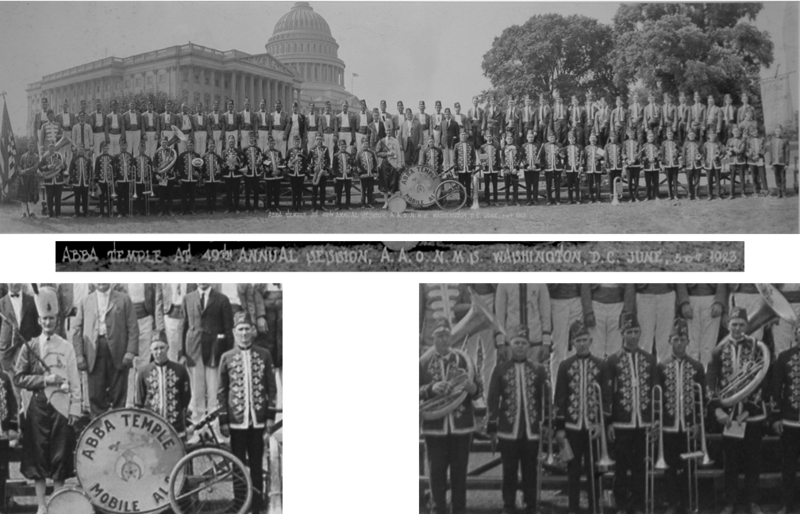 Panoramic group portrait of the Abba Temple officers, brass band and other units, posed before the United States Capitol Building, Washington, D.C. Far left, US Flag bearer. Far right, color guard holding a banner which reads ABBA TEMPLE, AAONMS, MOBILE ALA. Man with marshal’s baton, standing front row, center, is literally head & shoulders above all others, let along his hat. Group portrait of the Ballut Abyad Brass Band, in full regalia, posed in front of the Silver City Train Depot. Men without fezzes and wearing suits kneel in front, members of the public looking on visible in background. 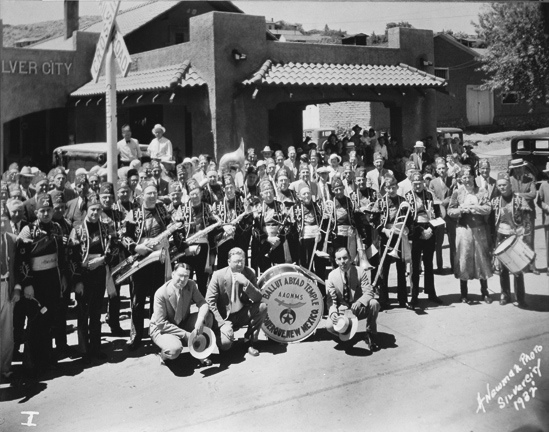 Clearly legible on the bass drum, center, is the legend: “Ballut Abyad Temple AAONMS Albuquerque, NM”. On the wall, upper left, can be seen “[S]ILVER CITY”. A railroad crossing sign stands in the midst of the crowd of Shriners, whose fezzes (all in bullion embroidered lettering and design, seemingly) read “Ballut Abyad” (no unit or officer/divan additions visible), and whose sashes read “New Mexico”. A nicely ferrotyped GSP on heavy weight paper. Purchased at a small antique store in late fall 2008 in San Antonio, NM, near the Bosque Del Apache Wildlife Refuge. 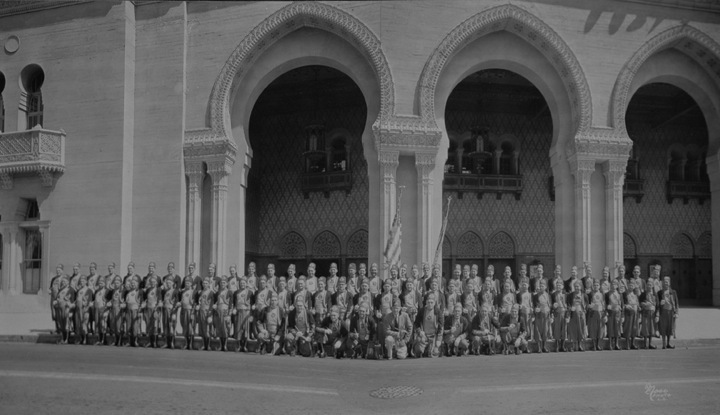 Panoramic standing portrait of the El Kalah (Salt Lake City, UT) Temple Patrol at the 1922 Imperial Council in San Francisco. The men are attired in matching suits with breeches. Upper left and upper right are two inset portraits of men in Islam Temple fezzes, which was the Shrine Temple in San Francisco at that time and no doubt the host of this event. A GSP on a sturdy paper. Won for a song on eBay. 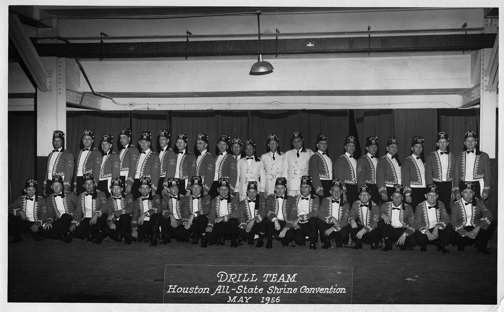 Group portrait of the Ben Hur Temple Drill Team. 1956. Thirty-six men, in costume and fezzes, lined in two lines, one kneeling, one standing. All wear short jackets with elaborate embroidery (probably) along the hems and cuffs, except for four men in top center, one of which is in a dark suit and the other three being in light suits with bandolier-like buckling belts. All in front of a hastily hung drapery, in a building made of exposed heavy steel I-beam construction, perhaps they are “backstage” in this photograph. 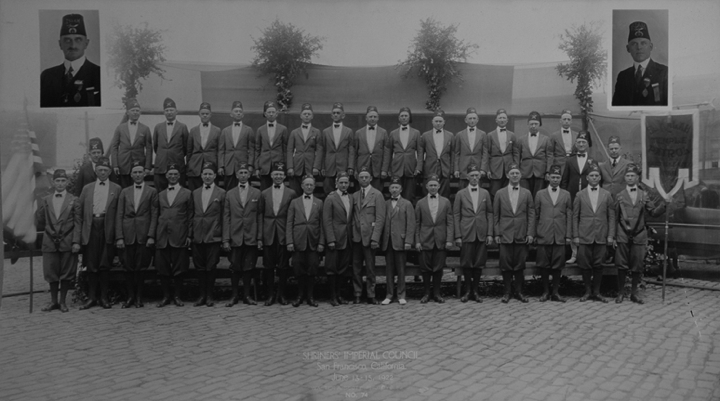 Landscape format GSP group portrait of approximately 90 men, all in fezzes and most in fancy parade costume of jackets, pantaloons and pointy boots. All are posed with crops or batons in one hand, tucked back under the same arm. Man kneeling lower center is the only one not in costume, but instead in a suit, and with a fez with the more standard emblem format of scimitar above crescent, the others’ fezzes showing the scimitar through crescent format. Posed on a street, before the Al Malaikah Shrine Auditorium, three of its large Persian arches visible, with ornately latticed double columns between each. This is actually printed from two relatively square negs, very carefully and expertly joined and printed. The separation is just visible to the viewer’s left of the American flag. A light paralax defect grows increasingly noticeable toward the top, in the architectural lines. This was given to me as a Christmas gift by Josh, Christmas 2009. Portrait of a man in a Mecca Shrine Temple fez. The fez is embroidered with the older, pre-Imperial-standard Mecca emblem with an upturned crescent with the Temple name in it, with a down-curving scimitar above and through the points of the crescent. He has a moustache and short hair, and wears a jacket with a Mecca lapel pin, with a white shirt with a short collar and a bowtie. 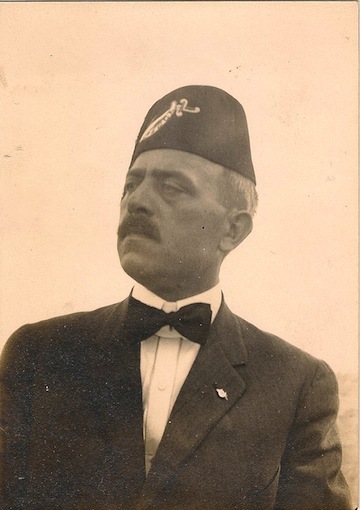 Sold as a lot with a Mecca fez, very probably the very one being worn in the photo.